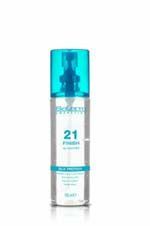 21 Finish is the name of the illuminator from the range. Not only does it illuminate and add natural shine to hair, it also leaves it silky soft, making it much easier to comb without pulling, which makes it especially suitable for long hair. It even makes light work of combing through recently washed or damp hair thanks to its lubricating qualities. And, just like all the rest of the products in the range, Finish has a repairing effect both on all the layer’s of the hair including the cuticle.